Water Audit services from AquaAudit are essential to you because billing errors seldom favor building owners or tenants, and DEP billing is known for inaccuracies that can add up to substantial sums. But most property managers—even when they suspect billing discrepancies—don’t have the time, skills, contacts or overall ability to maneuver through the intricacies of a successful audit. Every property owner can benefit by having AquaAudit perform a detailed and comprehensive water audit of its buildings. Property management firms know they stand the most to gain when they turn over their entire portfolio of buildings to AquaAudit for review. AquaAudit’s water refund experts routinely recapture revenue for clients. We know exactly where to look for billing errors. 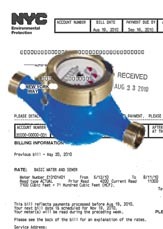 We find overlapping bills, estimated bills and bills for meters that don’t exist. We provide this service on a contingency basis, so there is never a cost to you unless a savings is earned. We’ve established a record of success due to our thorough analysis and our solid relationships at DEP. Contact us. In addition to our water meter reading and bill auditing services, we are also skilled in acquiring refunds from the Department of Finance (DOF). AquaAudit has been successful at using the same scrutiny in review of DOF billing of property taxes and other financial statements and has obtained substantial credits for clients by uncovering tax errors. Contact us. Who can benefit by having their water bills audited? Whether you are a landlord with one or two properties or a management company overseeing 100 properties, every audit is beneficial. Since DEP billing errors are routine, there is a very good chance we’ll uncover a discrepancy and obtain a savings. However, if no errors are detected, you’ll at least have peace of mind that your bills are correct. How long does a typical audit take to complete? Audit times can vary depending upon the complexity of what’s involved. Most can be completed in 30 days, while some can take several months. What is the cost of an audit? Audits are performed on a contingency basis, so there is never an up-front or out-of-pocket expense. We only get paid if a savings, credit or refund is obtained. What types of properties should have their bills audited? Any DEP bill can contain errors, so the specific type of property doesn’t really matter. Whether or not the building is strictly residential (co-op, condo, rental) strictly commercial, a mixed-use property, a warehouse or an institutional building, all can benefit.